‘Boreland Mill, Kirkmichael’ painted by James MacIntosh Patrick. © the artist’s estate / Bridgeman Images. Photo credit: Perth Museum & Art Gallery, Perth & Kinross Council. Anne Symon was found dead under the mill’s wheel in 1883. Anne Symon (Simon) was my 3x great grand aunt; the elder half-sister of my 3x great grandfather, Donald Wallace. She died in 1883 under quite mysterious circumstances — suffering exposure (hypothermia) trapped under a mill-wheel. I discovered Anne Symon’s rather sad death by accident; a by-product of trying to flesh out my knowledge of Donald Wallace and his family. Scottish death records are extremely comprehensive and I use them a lot to corroborate other information. Anne Symon, record of death, 1883. Source: Scotland’s People. I found it really odd that if her body had been found under a water wheel, the cause of death wasn’t drowning, and I wondered (as you do) how she came to die in such a way. The useful (I hesitate to say “good”) thing about unusual or violent deaths is that they are subject to coroner’s inquests and are often reported in local newspapers — as Anne’s was. 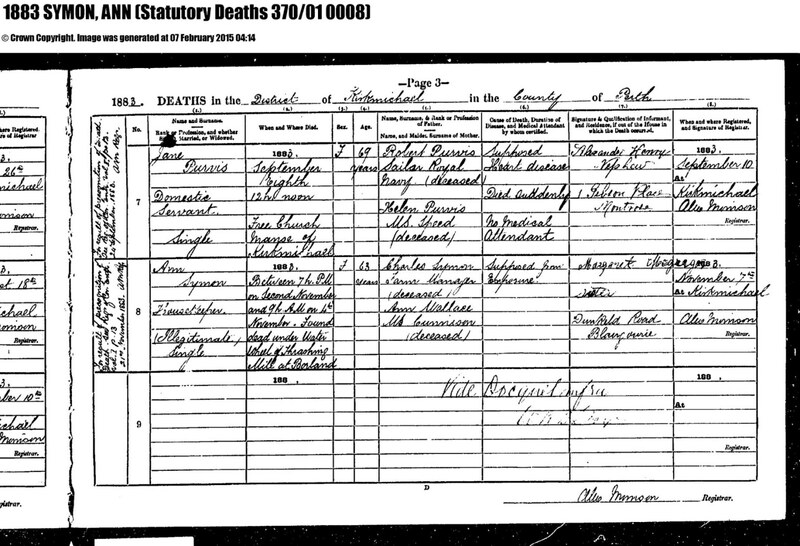 The RCE record for Anne Symon, shown below, is quite unhelpful; confirming only that the cause of death was exposure. This was certified by James Neilson, a doctor of Blairgowrie. 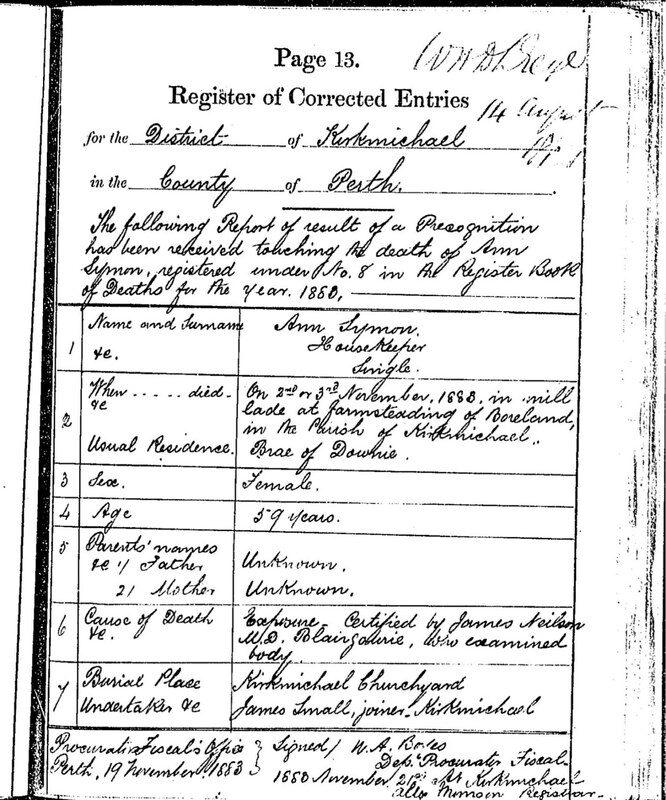 Death of Anne Symon, Register of Corrected Entries. Source: Scotland’s People. 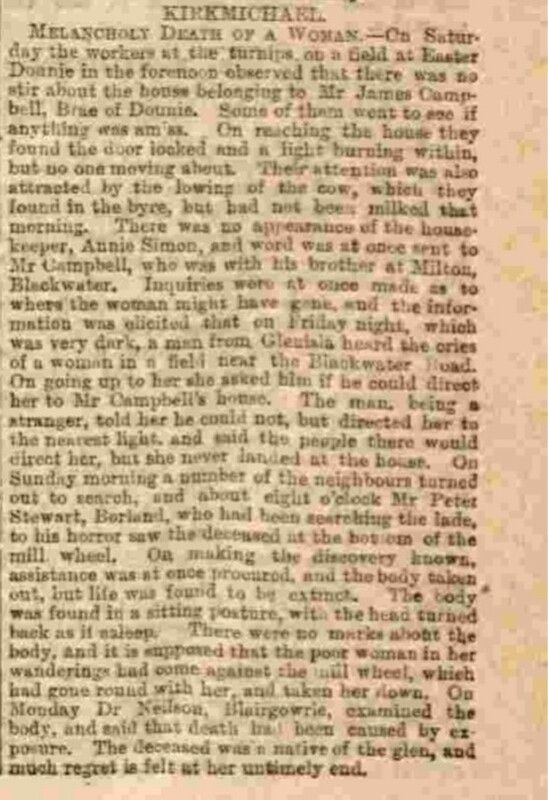 Anne’s death was reported in the Dundee Courier and Argus under the tagline ‘Melancholy death of a woman’. The article appeared on November 9th, and like the death record, raises more questions for me than it answered. Dundee Courier and Argus, Friday 9 November 1883. Image: British Newspaper Archive. If we assume that the man’s testimony is true (and accurately reported), and that the woman he met was Anne Symon (who had lived virtually her entire 58 years in and around the village of Kirkmichael) it seems a little odd to think she was simply lost. The report doesn’t suggest that she was drunk — which seems an obvious possibility, and hardly something newspapers shied away from. Other possibilities are that she had fallen and hit her head, or that she was ill and disoriented. If this were the case, I suppose she might have sat down by the mill, fallen asleep or lost consciousness and been dragged under the mill lade. I do struggle though to work out how she didn’t drown. I’ve tried to locate the various places mentioned in the article on a nineteenth century ordnance survey map of the area. I cannot find Brae of Dounie (Anne’s home) on any map, but the article reports that “workers at the turnips on a field at Easter Dounie” initially raised the alarm, so the house must have been in sight of that. The ordnance survey map shows Easter Dounie to the south of Mains of Dounie and Croft of Dounie, so I assume that Brae of Dounie is in the same vicinity. All are within about a mile of each other. 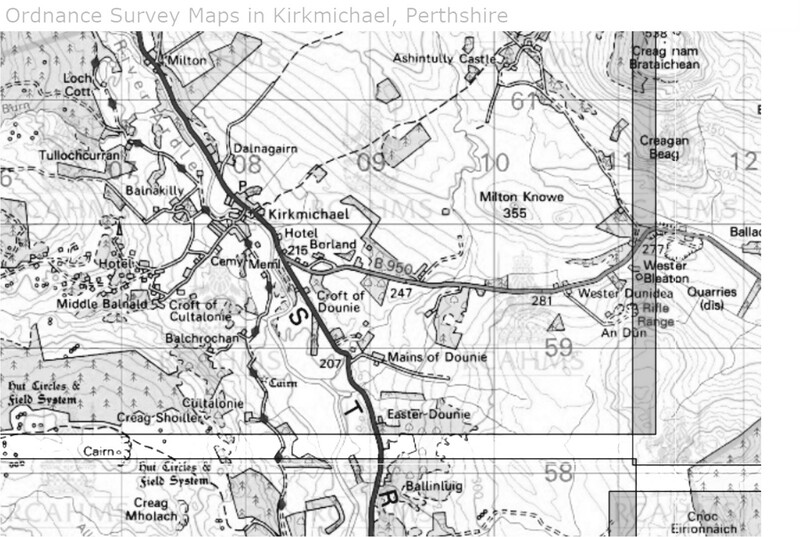 Ordnance Survey map, Kirkmichael area. c. 1860s. Source: screenshot, Scotland’s Place. The witness, whom the woman assumed to be Anne asked for directions, was on the Blackwater Road – which runs east-west, to the north of the various Dounies. The mill at Borland where Anne’s body was found, is just north of this road. The article stated that was a dark night — not surprising for early November in 19th century rural Scotland. There would have been no street lights, and only oil lamps and candles to provide light within houses, and I find it really sad thinking of a woman wandering alone in the dark, disoriented and unable to find her way home. This of course assumes that the witness testimony was true, and that Anne Symon wasn’t attacked and possibly killed, rather than dying accidentally. Anne Daughter Charles Simon, Ashintully and Anne Cunnison, Whitefield born 2nd and baptised 18th July 1825. Anne’s death record states that she was illegitimate. However, while other OPR records I’ve seen describe illegitimate children as “the natural child of …” this is not the case here. I don’t know if this was an oversight or if perhaps Anne Cunnison and Charles Simon were married. If so, I have not been able to find any record of this. James Wallace in Balnald and Anne Cunnison Whitefield both of this parish, were proclaimed three times on Sunday 28 of September 1828 in order to be married. If Anne Cunnison and Charles Simon had been married, Charles had presumably died. Even today, Kirkmichael is a very small rural community, and it is highly unlikely that a marriage could have been proclaimed between Anne and James unless both were free to do so. I looked for a death record for Charles Simon (or Symon — as is found in some records), for the period between the time Anne Symon would have been conceived and Anne Cunnison’s marriage to James Wallace, but have found none. In fact, I have found no records at all for a Charles Symon or Simon which contain sufficient information for me to believe they relate to the “right” Charles — so he remains a mystery figure for now. Robert Wallace, the first of James and Anne’s 10 children together was born on January 12th, 1829. My 3x great grandfather Donald was born in 1830, followed by Spence in 1832, Elizabeth in 1835, Alexander in 1837, Thomas in 1839, Charles in 1841, John in 1844, Margaret in 1845 and Christian in 1848. All but John Wallace survived childhood. The 1841 census shows the Wallace family — minus Ann Symon — living in Balnauld. James’s occupation is listed as shoemaker. The other possible match, indexed in Scotland’s People as Ann Symon, is shown as living in Pitcairns Court, Dundee. At face value, this would seem a much more likely possibility. Dundee is only around 30 miles from Kirkmicheal — a much more likely distance for a young woman to travel — and the town was home to a very large number of mills and other industry that attracted thousands of workers from rural Scotland, and indeed Ireland. There is however, one troubling matter. While the indexer for Scotland’s People has interpreted the handwriting on the census return as “Ann”, the indexer for FreeCen has seen the same name as “Susan”. I’ve looked at it repeatedly and can’t decide. What do you think? Ann or Susan Symon? 1841 census record. Image: Scotland’s People. It looks likely that I will never really know what became of Ann Symon during her early years. After 1851 however, there is more information available about her. 1851: Anne, age 25 was living with the Wallace family. Her occupation is described as house servant, and her relationship to head of household is daughter. 1861: Anne was living as a boarder in Strathardle with a woman named Mary McGlashin and Mary’s infant son. Her occupation is given as dressmaker. 1871:Mains Farm, Persie, Perthshire. Anne is listed as a Housekeeper, living in home of James McFarlane, ploughman, along with his family and other servants. 1881: Brae Of Dounie. Anne is shown as a domestic servant for James Campbell, Shoemaker. This is the same address and employer as in the article about her death. It seems that Anne Symon never married, nor had children, and spent most of her life working as a domestic servant in other people’s homes. 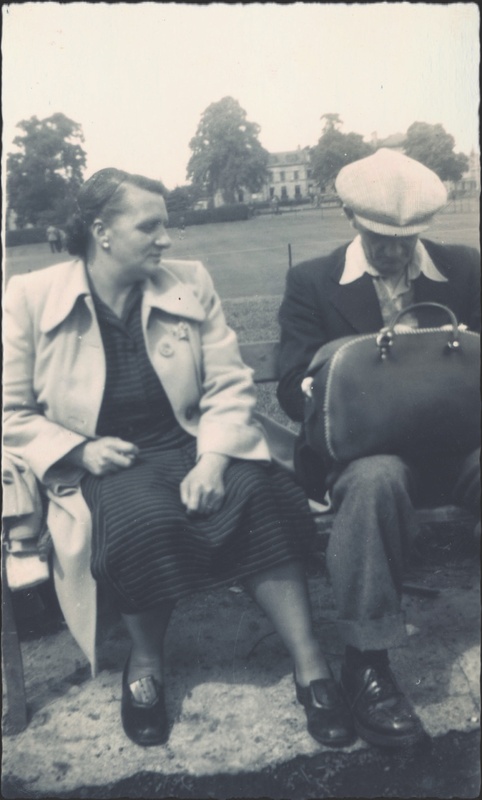 At the time of her death, both parents (and her step-father James Wallace) were deceased, and the informant on her death record was her sister Margaret, who lived about 13 miles away in Blairgowrie. The deceased was a native of the glen, and much regret is felt at her untimely end. In about a month the boy-child will sit his Restricted License Test. 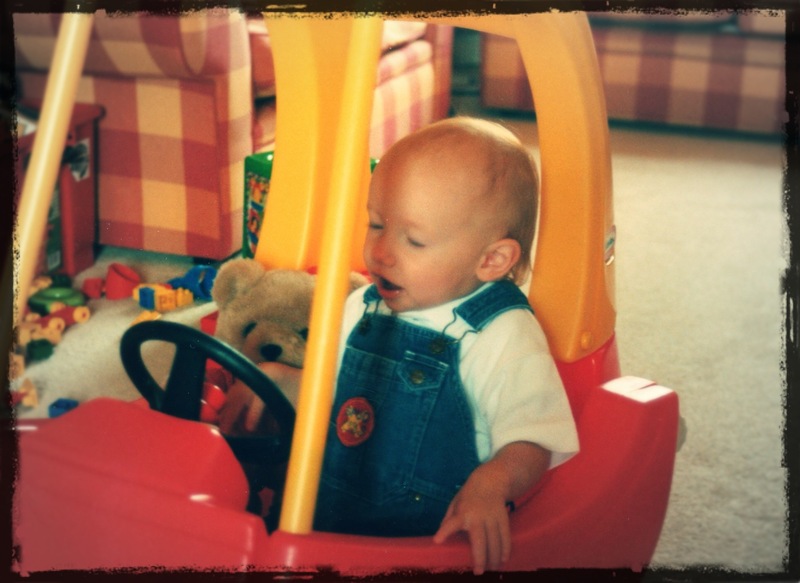 The learners’ phase is over, and he’ll have no more need for his mum in the car. Hopefully he’ll keep his eyes open in the big-boy car! Photo: Su Leslie, 1999. 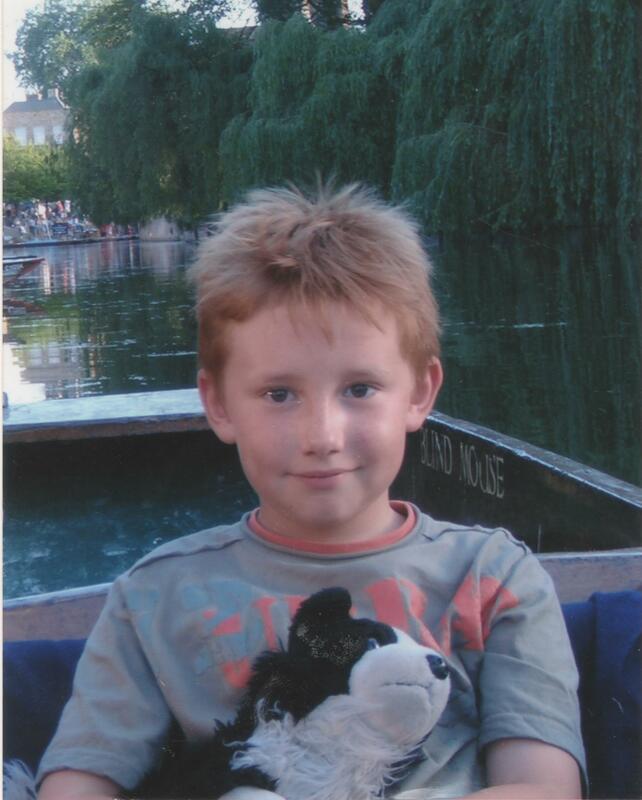 Aside from the obvious problem of generalizing from a sample of one, my possession of an image on that day was a consequence of my son having just had an particularly flattering passport photo taken. In fact, I didn’t normally carry his picture — I had never thought to cut one up small enough to fit in my wallet. But it got me thinking about the abundance of photos I DID possess of my son — and how normal is seems for parents to turn the camera lens on their offspring. The big T with our boy-child; the morning after his birth. Photo: Su Leslie, 1998. These days, with smart phones and social media, it’s only a matter of personal taste how quickly after (or during) birth, photos of our children can be spread around the globe. 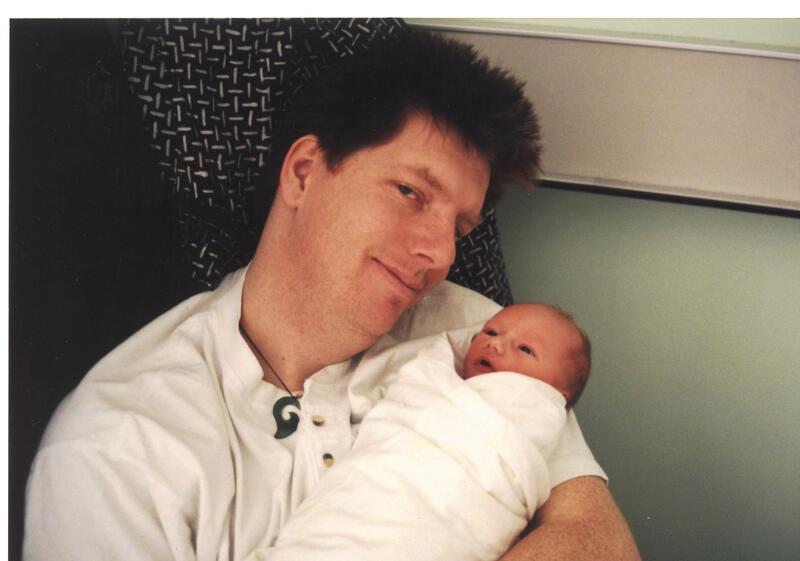 Seventeen years ago, when the boy-child came into the world, the Big T did have his camera at the birth, and we have several slightly out of focus shots of me in the delivery suite holding our newborn. But in those pre-digital, pre-FaceBook days, the photos were taken on film, and weren’t available for anyone to see until all 24 shots on the roll of film had been exposed and developed. 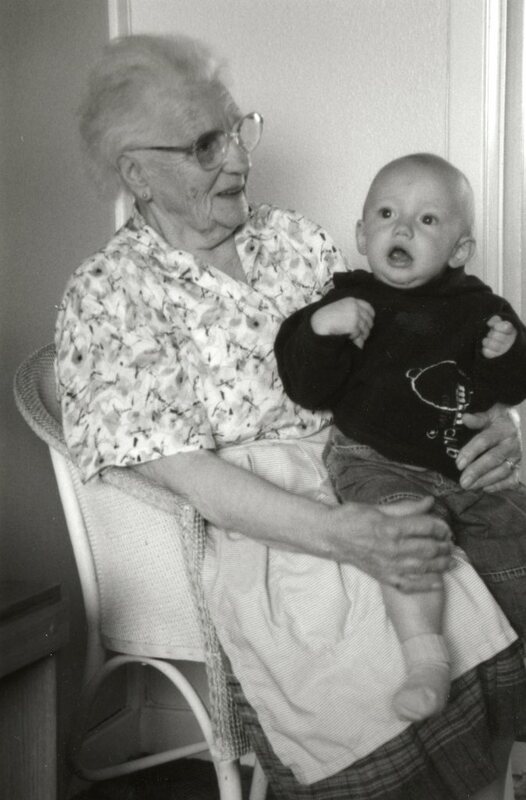 As both sets of grandparents lived in other countries, it would have been at least a week or more until they saw images of their new grandchild. A generation earlier, when the boy-child’s grandparents were becoming parents, the processes of capturing and sharing images of their children would have taken even longer. 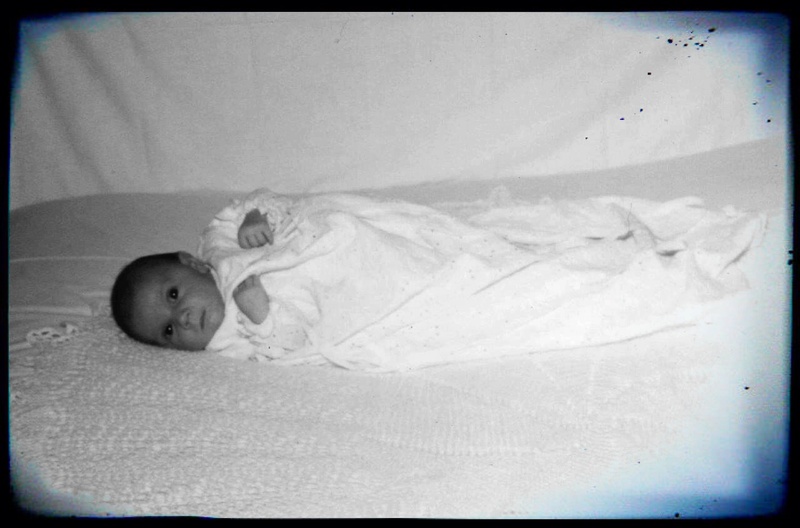 For a start, although both my father and father in law were keen photographers, neither were present at the births of their children. The earliest photos of me that I’m aware of were taken at my christening. 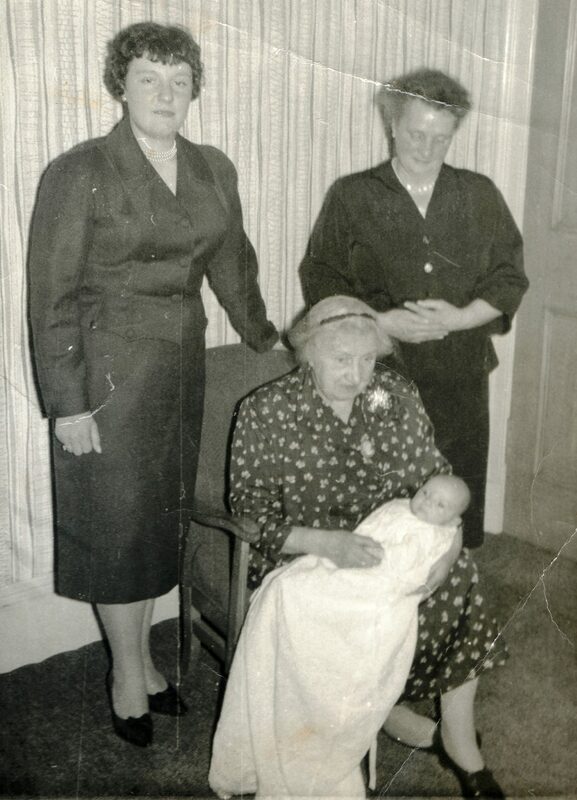 Christening, November 1961. Photo: Ron Leslie, Leslie family archive. Go back another generation, and camera ownership was less widespread. 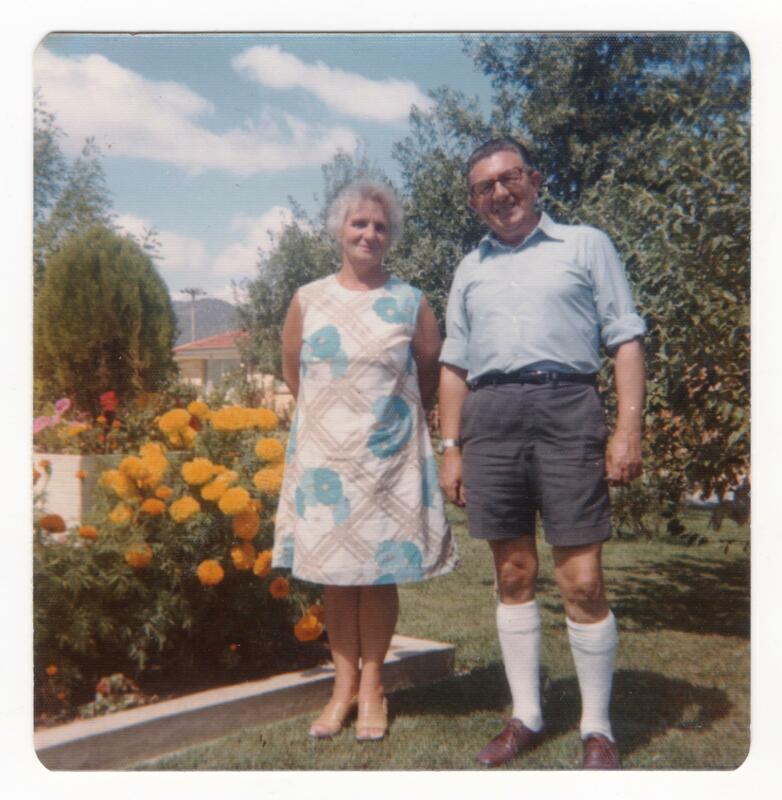 We are fortunate to have photos of both my parents as children. 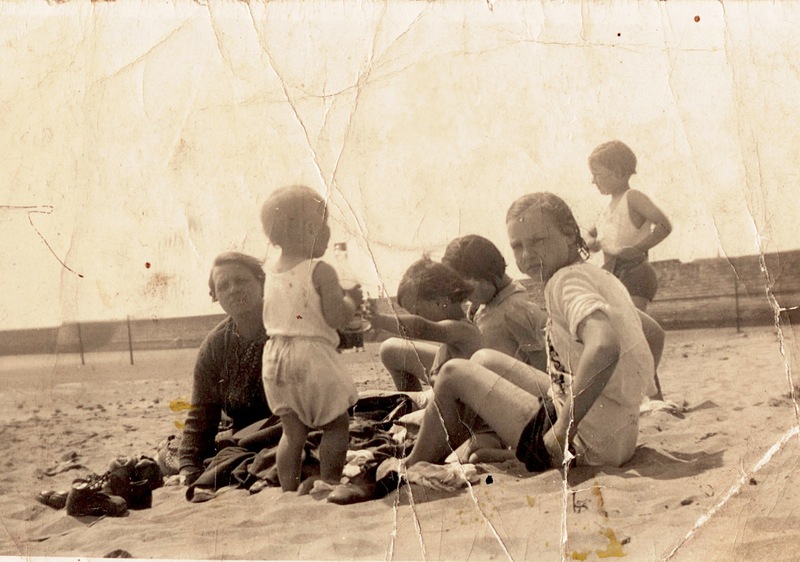 Margaret Ramsay (nee Cruden) and daughters at the beach, Kirkcaldy, Scotland. c 1941. 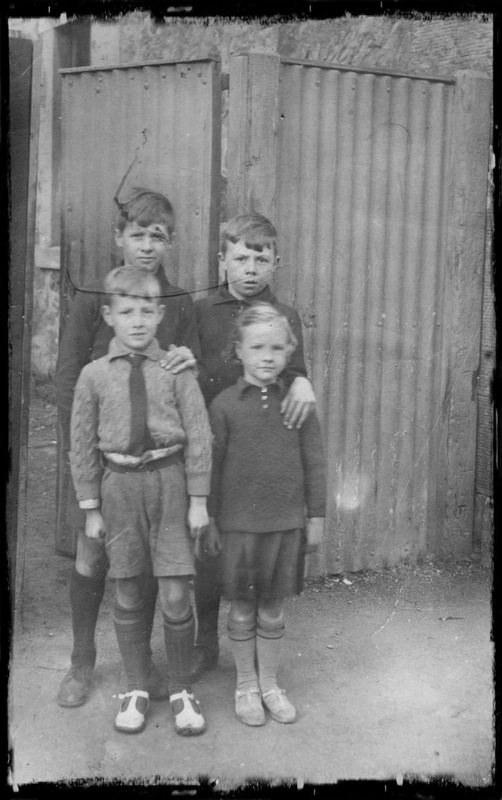 Photo: Ramsay Leslie family archive. 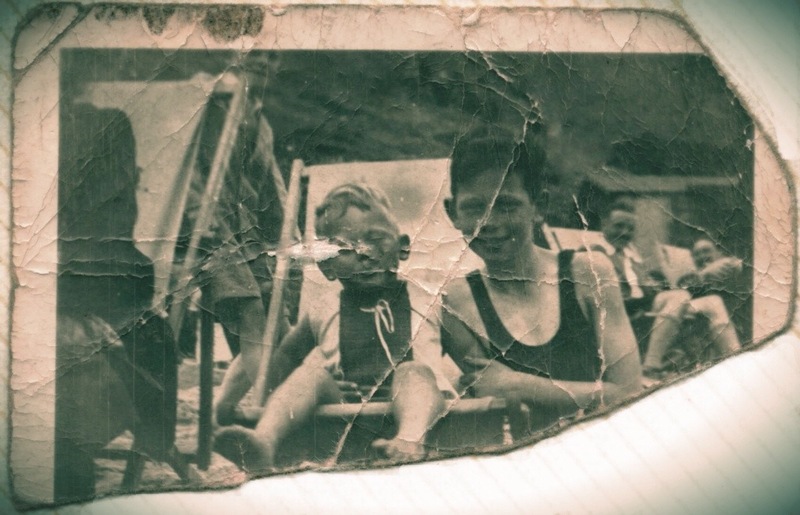 Fragment of a photo: Ron and David Leslie. Beach on Fife coast, Scotland. c. 1934-36 Photo: Leslie family archive. Although the Box Brownie (1) was first released in 1900 — revolutionizing photography by making it affordable to ordinary people — amateur photos don’t appear before the 1920s in either the Big T’s or my family (2), making our parents’ generation the first whose childhood was captured by enthusiastic family members, rather than professional photographers. Little rascals? 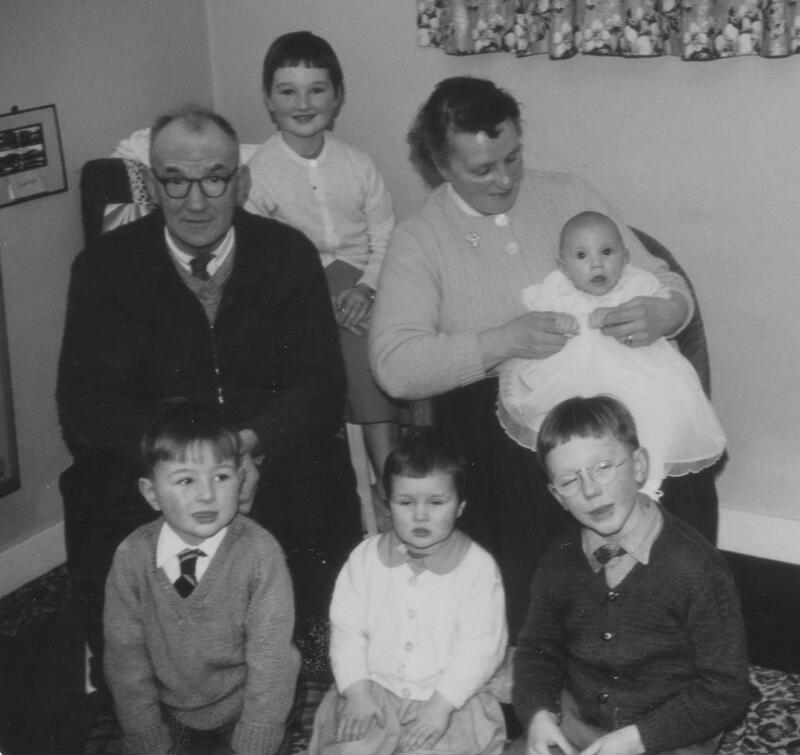 James and George Cruden (back row), with their niece and nephew; David and May Ramsay. c. early 1930s. Milton of Balgonie, Fife, Scotland, . 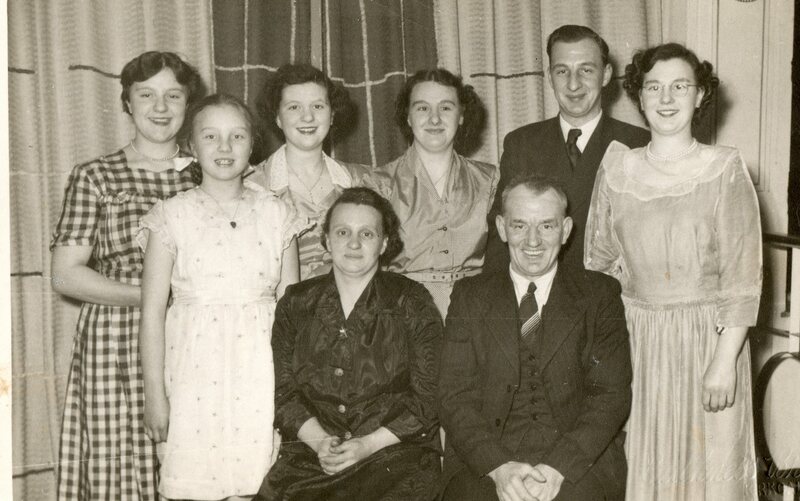 Photo: Ramsay Leslie family archive. 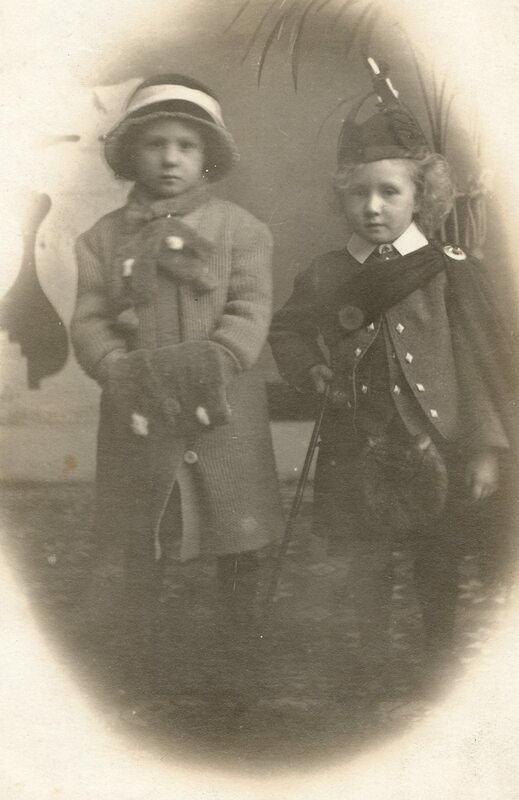 By contrast, I have a collection of studio portraits of my grandmother Margaret Cruden, and her younger brother Stewart, as small children. Stewart and Margaret Cruden, c. 1911. Studio portrait, probably Fife, Scotland. Photo: Ramsay Leslie family archive. I’m not sure why there are so many portraits of my grandmother. She and her brother Stewart were the eldest children of Alexander Cruden and Catherine Black. On my grandmother’s birth certificate, her father’s occupation is shown as coal miner, and it’s unlikely the family was particularly wealthy. 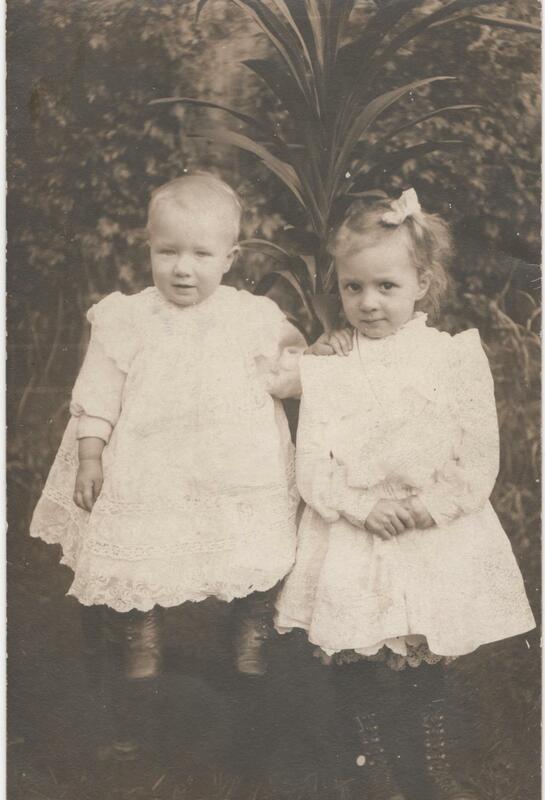 However, my great grandparents (or possibly their parents) took the children to several different studios for sittings during their early childhood. 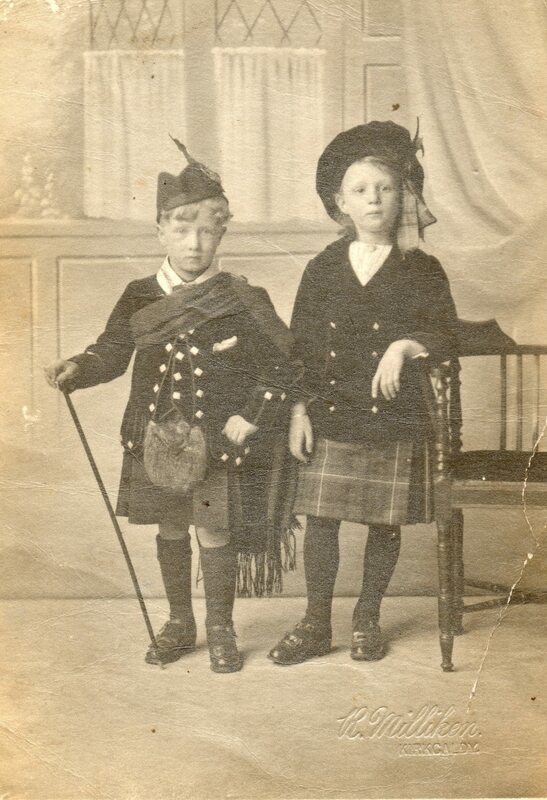 Margaret and Stewart Cruden, c. 1910. Studio portrait probably taken in Fife, Scotland. Photo: Ramsay Leslie family archive. Stewart and Margaret Cruden, c. 1915. Studio portrait, R. Milliken, Kirkcaldy, Scotland. Photo: Ramsay Leslie family archive. Stewart Cameron Cruden, c. 1914-15. Studio portrait, Colin Campbell Studio, Kirkcaldy, Scotland. Photo: Ramsay Leslie family archive. 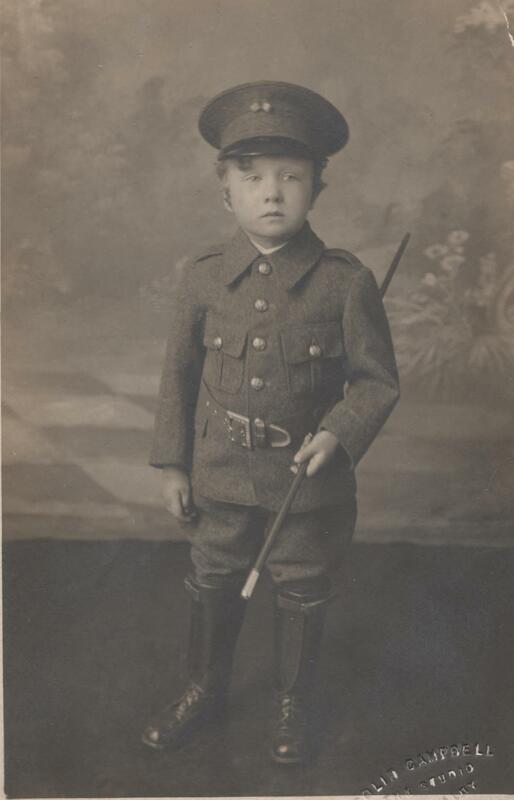 While I love these glimpses into the childhoods of my grandmother and great uncle, the last image saddens me, as all photographs of little boys dressed up as soldiers sadden me. The photo was taken probably during World War I, and I wonder if my great grandfather had already signed up. My great uncle has such a sad, slightly lost expression on his face. This post was written for Ailsa’s weekly photo theme at Where’s my Backpack. You can see more here. (2) With the possible exception of the Dove family, of whom we have a few images thought to be c. 1913-16.